The saying goes "you don't know what you don't know," so how do you start your research and develop a thesis when you don't know what it is you're supposed to be covering in your paper? 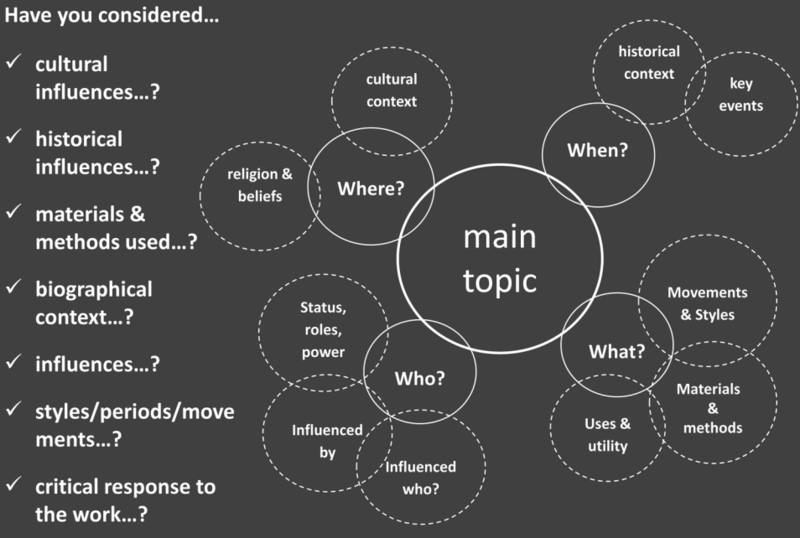 One way to accomplish this is breaking down your topic with a concept map, pictured to the left. Think about and start looking into the WHO, WHAT, WHERE, and WHEN surrounding your artwork. Breaking your object down in this way can start to reveal relationships between aspects of your artwork that may not have revealed themselves otherwise. Some of the information will be based on what you already know about your object, but some will need to be filled in through further exploration- using reference sources (like Oxford Art Online), books, textbooks, and other resources-- which brings us to the next tab in this guide, "Background pResearch & Keywords." From Gendron, H. & Sclippa, E. (2014). Where visual and information literacies meet: Redesigning research skills teaching and assessment for large art history courses. Art Documentation: Bulletin of the Art Libraries Society of North America, 33(2), 327-344.